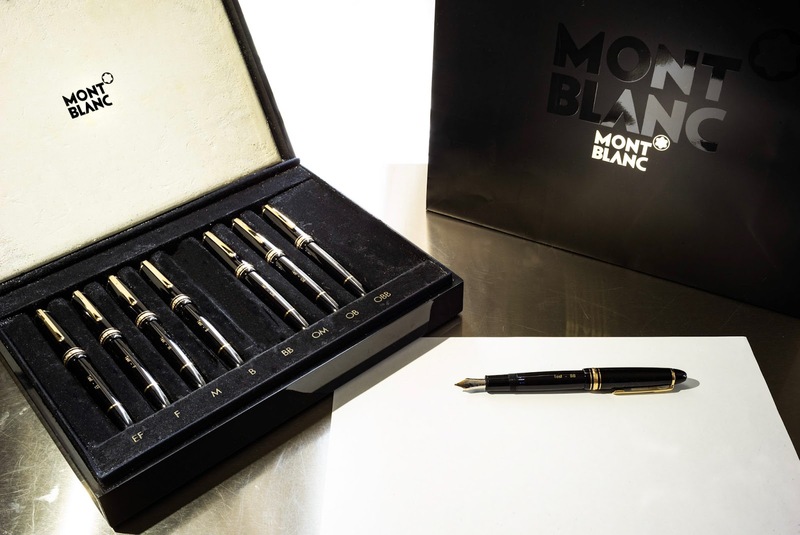 Mont Blanc Le Grand and Nib Selections - A quick view. EF: Extra Fine. The Mont Blanc extra fine nib draws a very thin line and is something that is too thin for my taste. But if you write in a very small font size or need to cram in a lot of notes in a small space, this is one to consider. Given that, it is narrow but not scratchy, as some extra fine nibs can be; it is very smooth. I noticed the ink flow is less than some of the other nibs which means you need to write a little bit slower. If you are a fast writer, this might not be your best choice. F: Fine. I didn’t notice much difference between Extra Fine and Fine, a very subtle size difference and just a bit more ink flow. I think it has very close characteristics with that of the EF nib, i.e. light ink flow and narrow font. Still not my favorite, but that is my personal choice. M: Medium. Medium is quite different in line thickness and ink flow. It has almost twice as thick of a line width as the fine and the ink flow is abundant. This nib size was much more to my liking and one that I think, if in doubt would be a great first choice. I have several fountain pens and many of them only came in Medium size (or that was all that was available) a such I am use to writing with the Medium nib and it is the yardstick against which I compare all other nibs. I like this nib. B: Broad. If you are looking for something that makes more of an impression, perhaps signatures or accented notes, I would say the Broad nib is for you. I choose this nib size when ever I need to sign an important document. Since the Broader sized nib results in a thicker line width, it takes up more space on the paper. Something to consider. I also like this nib a lot and my 149 is this size. BB: Double Broad. I have never tried a double broad Mont Blanc before, and I found this size nib especially pleasing. It draws a wider/fatter line so you can readily see the ink colors as you write. Also the thicker the line the larger the amount of wet text that is under your hand, so for me, a lefty, I had to be careful not to smudge the text as I wrote. The ink flow is wet for this size nib and I liked that, I could write fast and the pen ink flow kept up. Another great signature pen. OM: Oblique Medium. By ‘oblique’ I mean that the nib is cut at an angle (approximately 15 degrees) rather than squarely cut across the nib. The Mont Blanc Obliques are properly called Left Obliques, because they are cut at the same angle your toes make across your left foot from little toe to big toe looking down at them from above. Depending on how you hold the pen and it’s angle with respect to the paper, this pen either works for you or it doesn’t. As it turns out, for the way I write, these Oblique nibs are perfect for me. I don’t have to think about how to hold the pen, my hand just does, and everything is fine. I found the OM made too thin of a line width for me (narrower than the regular medium (M)) and therefore I did not like it as much as the medium. But I did like how the obliquely cut nib adds character to my lettering, a thick/thin up stroke and down stroke adds a sculpted contour. OB: Oblique Broad. This is one of my favorite nibs. It has a nice thick line with a more readily apparent thick/thin line variations as I write. The ink flow is abundant, which means I can write at a faster speed, yet very smoothly. OBB: Oblique Double Broad. 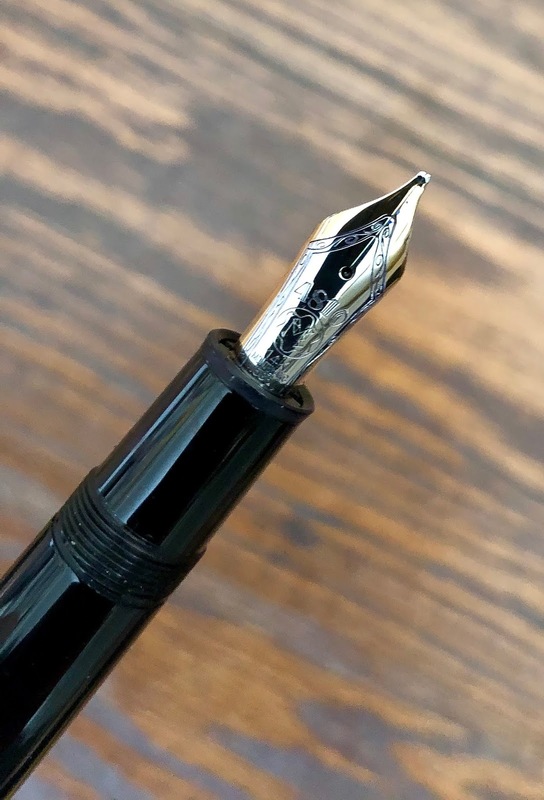 The last nib in the main Mont Blanc selection, it has more of the same positive characteristics as the OB. This means more line thickness bigger bolder lines. More ink means darker and larger text. If you like large text sizes and have plenty of paper, maybe you should try this nib. I like it very much and it is up there with the OB in my preferences. So in conclusion, you can’t go wrong buying quality Mont Blanc pens. 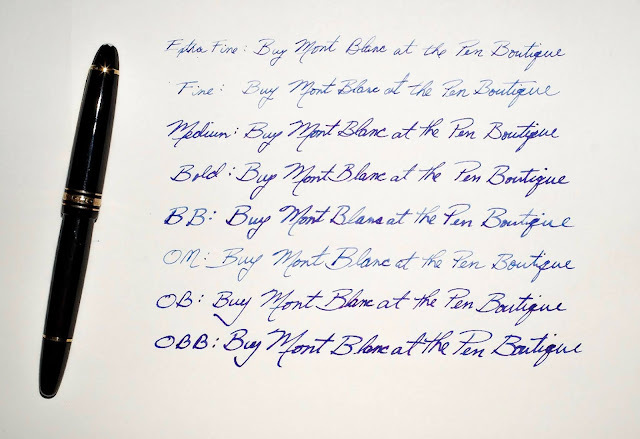 Month Blanc allows you to swap nibs for a period of time after your purchase (for no charge) if what you purchased was not to your liking. I suggest, if you live in the area of Pen Boutique (Washington DC, Columbia Maryland) drop in and try all of the nibs out for yourself and you will be amazed how different the nibs feel and the results they produce. Looking at the photos, the paper used for this test was Tomoe River A4 (letter) size – white loose sheet (sku: TR_RURA4WL) and the ink was a wonderful Cobalt Blue from Graf von Faber-Castell.